Properties in Antonino Uccello House-Museum average 4.7 out of 5 stars. Holiday House "Marina" 4 Minutes Sea and 400 m. from the City Centre. Live it ideal for the holidays in total relax! Property 11: Holiday House "Marina" 4 Minutes Sea and 400 m. from the City Centre. Live it ideal for the holidays in total relax! Apartment Murri. Apartment on the first floor. Free parking. Property 50: Apartment Murri. Apartment on the first floor. Free parking. 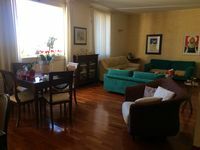 A very lovely, bright and spacious apartment in a quiet neighborhood. This apartment is modern, well laid out, with very nice and well-chosen furnishings. Three bedrooms worked well for us, and although one had a bunkbed, we were very comfortable. The 1 full bath and half bath also were well appointed and convenient for the 3 of us. We cooked some of our meals in the apartment. The kitchen was open and stocked adequately with cooking and eating utensils. Shopping for food and other necessities was very convenient in the neighborhood, with a bakery, fish market, meat market, coffee shop and other shops, only a short walk away. Ragusa was also a convenient taxi ride away from places we wanted to visit, like Ragusa Ibla, Modica, Scicle, and Marina di Ragusa. We also visited Siracusa while in this area. The owners were warm and welcoming, and very attentive to correcting the problem when we encountered some power outage issues. We thoroughly enjoyed our time in this part of Sicily! Communication with the owner, Rudia was very easy. The thorough directions for arrival were clear and easily followed. We found the apartment to be just as lovely as the photos show, the bed very comfortable ( unlike the often found very hard ones) and the terrace was so wonderful for relaxing on. 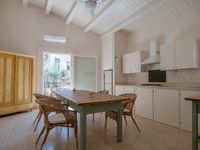 The location of this rental could not be better as it is just a few steps from the Corso Umberto, the main street through the lower portion of town which is much easier for walking around as compared to Modica Alta (up on the steep slope). Everything you could want is within a five minute walk and do not miss eating at one of Rudia&rsquo;s recommendations, Putia ru Vino which is a very short walk away and serves delicious Sicilian cuisine at reasonable prices. There is a cafe just about across the Corso when you walk down from the apartment that has the best Illy coffee and light flakey coronetti. I do not remember the name but you will see the Illy coffee on a sign. You will not regret renting this apartment as it is very special!